With every battle you will win a chest (as long as you have a chest slot available), but do you know that the chests follow a fixed cycle and getting a Giant Chest or a Magical Chest is not random? It’s predictable when these chests will appear and in this guide, I’d like to show you how the Chest Cycle works, how you should plan the opening of your chests and also which Chest Tracker work to keep track of your own Chest Cycle. 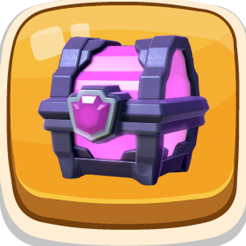 What’s The Chest Cycle in Clash Royale? I already told you at the beginning of this page, that chests don’t follow a random rule – they follow a fixed cycle that you will always run through over and over again. The Chest Cycle is 240 Chests in total and starts with our first chest you get in Training Camp. After that, you will get the next chest in order. If you think that you can simply do matches with filled chest slots until a Giant Chest or Magical Chest is next, I have to disappoint you. You will ALWAYS get the next chest in the cycle, no matter if you played matches while you haven’t gotten any chests. The good news about that, however, is that you won’t miss any chest. So you have found Silver Chests, Golden Chests, Giant Chests and Magical Chests in the chest cycle – but you might have gotten a Super Magical Chest or even a Legendary Chest so far. It’s true that you can also get these chests, but they do drop randomly and replace the chest that you would get according to the Chest Cycle – they are completely random and there’s nothing you can do about it. You’re guaranteed to get one Legendary Chest within 1 Chest Cycle (240 Chests) when you’re in Legendary League or within 2 Chest Cycles (480 Chests) if you’re below Legendary Arena. Attention: If you drop out of Legendary Arena only once during that Chest Cycle, you’re in the 2 full Chest Cycle drop ratio again. I know some people that like to use a Chest Tracker App to keep track where they are in their Chest Cycle – basically, you always add the chests there that you got, and the app will show you what chests you will get next. I personally don’t use this because I’m lazy at one point and there’s also no real benefit from having it. You know what chests you will get next, but there’s no difference because you can’t do anything about the next chest you will get and my chest slots are always filled. Planning which chests you open can make an impact on how fast you will open them – the goal is to always have a chest in the unlocking process all the time. I always open the Silver Chests during the day, and when I’m playing, so the next chest slot becomes available as fast as possible. I try to open the Golden Chest either over night, or when I know I won’t be able to play for the next 8 hours. The same with Magical Chests and Giant Chests. This is pretty much common sense.